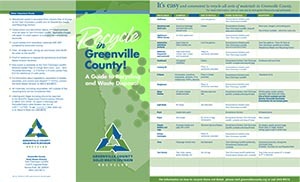 What can I recycle in Greenville County? Used motor oil, filters, bottles, etc. Does not have to be in original container; it can be poured into the drum on site. Collected at all Home Depot stores nationwide. Tree limbs, leaves, grass clippings, etc.